For many organizations, evaluating nonprofit fundraising software and mobile bidding platforms can be head-spinning and time-consuming. As a nonprofit, you want as many of your funds as possible to go to the charitable cause — not to costly, bulky platforms that do little to impact the bottom line. Plus, flashy software terms often adds confusion without answering any critical questions. Nonprofit organizations need smart, actionable tools that help raise more donations, engage more donors, and deliver results for the cause without excessive manual work. That’s why requests for proposal (RFPs) are so important when evaluating nonprofit software. Nonprofit teams can leverage RFPs to identify exactly what they want from a fundraising platform – whether it’s mobile bidding capabilities, online fundraising, CRM integrations, or full service event services. 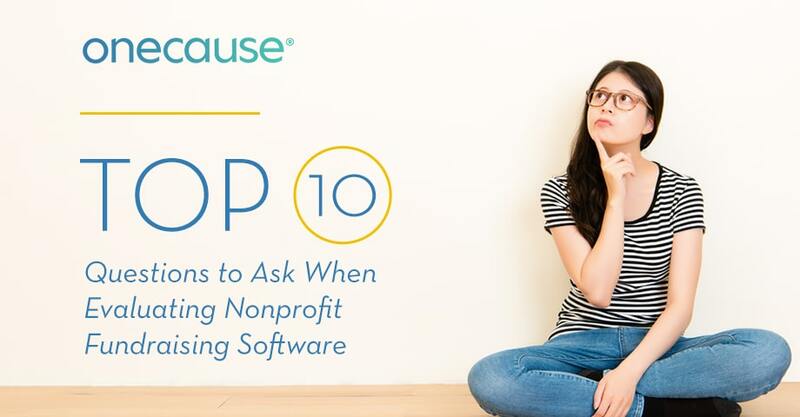 Asking the right questions during the RFP process when your evaluating nonprofit fundraising software can help narrow your choices down and highlight the platform that is the right fit for your organization. Can this solution handle all of my events and fundraising efforts throughout the year? Oftentimes, nonprofit fundraising platforms and mobile bidding packages charge per event or per fundraising activity, and any additional events or fundraisers are slapped with an added event cost. Your organization needs a platform and/or mobile bidding solution that helps your team raise more money for a cause, which is why a true fundraising software partner supports in all of your fundraising initiatives year-round. Make sure the solution isn’t a ‘one-and-done’ partner by evaluating its policies around multiple events, additional giving sites, and add-on fundraisers throughout the annual subscription. From live and silent auctions to mobile bidding, donations and social fundraising, a true year-round platform supports your fundraising calendar. Is this solution flexible enough to work with the constantly changing schedule of my team? If there is one thing nonprofit teams can count on, it’s last minute changes. Don’t waste your time with platforms that require auction data to be sent weeks before an event. Instead, look for solutions that make it easy to add and change auction selections and update event information until the very last minute and even during your fundraiser. After all, adding more auction items certainly isn’t a bad thing, and your team shouldn’t have to give up on potential donations because of a technology restriction. And once an event wraps up, you’ll want to have access to the system and data. Some vendors require that they upload the data, but as a nonprofit, you need to be able to move quickly, control and access your data at all times – not rely on someone else. How is the platform accessed? Does my team have to download anything? Are there any hardware requirements? A truly optimized fundraising platform should be able to optimize bidding, donations, and event management from multiple access points. While apps are fine for event staff, donors and guests shouldn’t have to download anything just to make a donation. For larger events with multiple staff members, complex registration requirements, and serious back-end planning, equipment may be needed. Asking this question in the RFP process ensures your team is ahead of the curve and prepared for any additional fees. Does the mobile bidding allow you to send personal messages – text, email, etc. – directly to donors from the platform prior to our fundraisers? When it comes to communicating with donors and event guests, text messages and emails are typically the most effective forms of engagement. While many nonprofit fundraising and mobile bidding solutions offer text message capabilities, it’s not always possible to personalize the messaging to donors. Having the ability to personalize texts before, during, and after an event makes donors feel special and recognized and can also help influence more donations. Also being able to email receipts to donors post-event is a must-have timesaver! With the right fundraising solution in place, streamlining communications can save time and create a long-term donor relationship. Does this solution integrate with my CRM platform? What types of data points does it capture? Many nonprofit teams use a CRM platform – such as Salesforce or Raiser’s Edge – to manage donor contact information, status, and type. Instead of manually updating these lists, your team can integrate your new fundraising software with your CRM platform to connect detailed event, auction, and donor data to specific donor records. It’s now easy for nonprofit teams to identify specific audience lists such as ‘High-Dollar Donors’ or ‘Past Mobile Donors’ or ‘Previous Event Attendees’ without any manual list building or contact editing. As a nonprofit, it’s key for you to be able to easily move data back and forth and have complete control over your data at all times. Make sure to ask potential vendors in-depth questions about how accessible and movable your data really will be so you aren’t caught off guard. Can I process in-person, online, and mobile payments with this platform? Today’s donors are constantly on the move and expect a fundraising experience that moves right along with them. Before choosing a nonprofit fundraising solution, make sure the payment processing workflow is easy to manage and efficient for both the donor and your team. It’s also important to ensure that all credit card types (such as AMEX) are honored to provide maximum options for your donors. Whether you’re collecting donations in person, online, or even via text message, you shouldn’t have to wait a week for a payment to go through. Look for a fast, secure online platform that makes donor transactions a breeze for both sides. Is the user experience easy for donors to navigate during the fundraising process? Nothing screams ‘disorganized fundraiser’ like a hard-to-navigate donor experience. Anywhere a donor is engaging with your team or cause – whether online, through a mobile app at an event, or via social media message – the donation and or mobile bidding process should be clearly outlined, easy to understand, and simple to navigate. The easier the process is for your donors, the more revenue you’ll see for your cause. What reports and insights can I expect to see with this platform? How can these reports improve my fundraising efforts in the future? Nonprofit teams often think that the fundraising process starts and ends with events and campaigns, but it can actually be so much more than that. Look for a nonprofit fundraising platform that captures detailed data and analytics on the backend to help inform future decisions and strategy. Whereas before your team had little insight into how auction items influenced donation totals, now you can analyze the audience profile of an event, the mobile bidding trends and compare this to the auction items available to see if the mix is optimized or if it needs a few changes. Data is the key to proactive strategy, even in the world of nonprofit fundraising. What does the Support structure look like? When you’re evaluating nonprofit fundraising solutions, make sure you know exactly what kind of support you can rely on at every step of the event process. Does the solution provide on-site event staff? What about on-site technical staff? Does the support team work after normal business hours, and do they honor hours on the west coast? Having the right support in place can make or break an event, which makes it so important to bring up during this RFP process. What is your policy on PCI compliance and security of payment processing? In today’s day and age, consumers demand security for personal information – especially financial data. Perhaps the single most critical aspect to consider when evaluating a fundraising solution is the company’s PCI (payment card industry) compliance and payment security standards. If there is a data breach, it’s your fundraiser that will take a majority of the fire. Be sure to look for a vendor that is PCI certified and compliant.